In the realm of mental health, every year seems to bring a new “fashionable” diagnosis du jour. Sometimes, these “hot” diagnoses pass out of favor fairly quickly (i.e. – the sharp uptick in pediatric bipolar diagnoses we saw about 5 years ago) while other trends seem to herald something real. This year, at our practice we have seen a lot of kids anxiety disorders. A quick recent check of our files revealed that at least 50% of the kids currently enrolled at Academy MetroWest have either been diagnosed with an anxiety disorder or are being monitored for one. Anxiety’s not unique to our practice either. It seems to be everywhere in our fast-paced, stressed-out society. In the town where I live, Lexington, MA, we seem to be at Ground Zero for the anxiety epidemic. While there is much to recommend about Lexington, it owns a well-deserved reputation for being a bastion of the overachieving and the overeducated. It’s a wealthy town but it’s not old money that stuffs the coffers of its residents. Smart people from the STEM fields are drawn by our highly touted public school system as well as by Lexington’s proximity to area universities and companies in the fields of biotech, computer technology, and others. This driven population has had a decidedly mixed effect on the experience of students within the public schools. On the positive side, the culture in town is one that places a premium on education and learning. While there are social dynamics and cliques like anywhere else, kids seem less likely to be viewed as nerdy or geeky if they’re motivated to learn or read than they are in other places. Despite an emerging issue with overcrowding, the schools always seem to have the resources they need to provide students with a great education. On the other hand, the Lexington schools can be a pressure cooker. The same culture that fosters curiosity and inquisitiveness among students also places expectations for work and achievement very high. In my experience, that pressure comes in much greater measure from parents than it does from the school system. In Lexington, like Lake Wobegon, all children are perceived to be above average. The pressure on kids to stay that way is palpable. I didn’t have any inside knowledge of the working methods employed by the other participants, but let’s just say that even in my own little Lake Wobegon of a town, elementary school students would need to have some extraordinary skills in order to pull off some of the projects they presented. For example, a couple of booths down from us was a kindergarten student who presented a 3D, cross-sectional diagram of plate tectonics. Down at the end of our row, a 1st grader displayed a homemade model of the solar system. When you pressed a button, not only would the corresponding planet light up, you’d also hear a recorded message about that particular planet. Yeah pal – you put that together yourself, right? So, that’s what the culture is like in Lexington. The pressure starts early, parents tend to be hyper-involved, and the expectations only get higher as kids get older. So when the principal at my daughter’s school sent out “the homework letter” parents had mixed reactions to it. On back to school night, most parents seemed to be on board with the new policy but there was some grumbling from parents looking for a more rigorous approach. Research and media coverage on the merits of homework seem to be popping up all over the place these days. Youki Terada, writing in Edutopia, an online magazine focusing on the field of education in July, 2015, presented a synopsis of the research on homework and its efficacy. He claims that research shows that while homework can yield substantial benefits, those benefits are clearest for high school students and seem to diminish for middle schoolers and, particularly, elementary students. 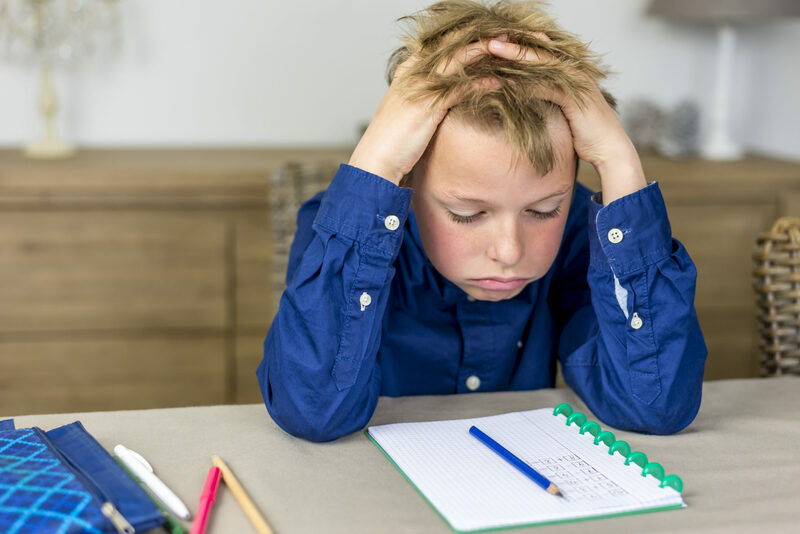 Research also suggests that homework can cut into valuable family time and, when assigned excessively, can actually have a negative impact on academic performance. According to Terada, “The goal shouldn’t be to eliminate homework, but to make it authentic, meaningful, and engaging.” Sound familiar? So maybe the pendulum is swinging back to a more reasonable set of expectations for our kids. While some aspects of anxiety stem from neurological factors, 21st century American society nourishes that anxiety among our kids in many ways. I’ve always been a big fan of our public schools. But as a counselor, I’ve spent years listening to parents tell me about how battles over homework have threatened to destroy the relationships they have with their kids. Parent-child relationships are some of the strongest predictors of academic success so let’s hope we’re moving in the right direction on this. I read your article, and I totally agree with this homework issue. My son has NLD and he has executive function skill diffculties. Until the school made up a homework contract as part of his IEP, he was stressing out completely with it. He was spending too much time on each subject and had no time for family or other thing. Since enforcing this contract (at 15 minutes limit a subject) he has been less anxious. I wish all schools would adopt a no homework policy. Hi Laura.Thanks for reading my blog and for your comment. Sorry for the delay in responding. I was having some technical issues but they seem to be resolved for now. Anyway, glad you enjoyed this entry and thanks again.